Successfully Added 10.1 Inch Portable DVD Player - 270 Degree Swivel Screen, 1280x800, Region Free, Hitatchi Lens, Anti Shock, Game Emulation to your Shopping Cart. 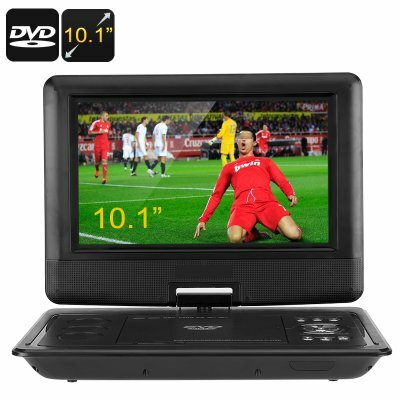 Watch movies, listen to music and play games anytime anywhere with this 10.1-inch portable DVD player and entertainment system - the perfect accompaniment for long journeys and family holidays. With its large 10.1 inch TFT LCD display bringing HD 1280x800 resolutions in a 16:9 aspect ratio you will be able to enjoy movies in all their full glory without any cropped or distorted images. The screen is able to rotate 270 degrees allowing this DVD play to be easily positioned for optimally viewing. With this region, free decoding this DVD player is compatible with most disc formats so there will be no restrictions on which DVD's it can play. Whether you purchased them at home or abroad, discs from every region will play on this portable DVD player so you can enjoy your full video library without any restrictions. With its precision, Hitachi read lens and anti-shock features the DVD player will read ahead and play the from a buffered memory allowing it to eliminate jumps and skips when used on the go. Battle bad guys, jump on mushrooms and race to victory in 32-Bit game emulation that lets you enjoy classic arcade moments and brings hours of family entertainment. Play music with the FM radio tuner that will pick up stations from 87 to 108MHz or enjoy music from CDs or USB pens with MP3, WMA, and MP4 music files all supported. This 10.1-Inch portable DVD player comes with a 12 months warranty, brought to you by the leader in electronic devices as well as wholesale DVD players and media gadgets..